Senator McCain said that members of his own party that are concerned about “Drone Strike” policy are “wacko birds” while insisting that no innocent Americans are going to be killed with drones. The problem is that innocent Americans have already been killed, namely the 16 year old AMERICAN son of a terror suspect. The Obama Administration flippantly said “the kid chose the wrong father” when critiqued. President Obama asserted that he has the power to lock up Americans indefinitely or even kill us, his administration has even made cracks about the “kill list“. When questioned about some of these extra constitutional powers they said, “trust us” because they would give people on such target lists “administrative due process” which is something that the Obama Administration made up out of this air and essentially means that even when it comes to Americans not engaged in combat, but are merely viewed as a terror threat, the Administration can act as judge, jury and executioner. Keep in mind that all of what we just told you are facts that are not in dispute. This made some civil libertarians in both parties nervous for good cause. So members of the House and Senate started asking questions about how the Administration sees the limits of this power and in every case the Obama Administration would use lawyerly rhetorical slight of hand to avoid answering simple questions about the limits of such a policy. Over and over Senators such as Rand Paul would ask simple questions, so would Senator Ted Cruz, only to get the run around. After weeks of rhetorical gymnastics and Senator Rand Paul’s epic filibuster the Obama Administration, suffering public humiliation on the issue, finally answered a straight question with a straight answer. Why can we not just “trust them”? Keep in mind that the Obama Administration willingly and knowingly sent guns to Mexican Drug Cartels in an effort to blame the subsequent loss of life (hundreds killed including an American border agent) with those guns on American gun owners and use the subsequent bloodshed as an excuse to attack the 2nd Amendment. The administration was outed by their own federal agents. This is the same administration that is facilitating the transfer of arms to Al-Qaeda and the Muslim Brotherhood in Syria, helped the Muslim Brotherhood take over Egypt and Libya (Jordan is next) and is even sending tanks and F-16’s to the Muslim Brotherhood in Egypt who are already murdering Christians, promising war with Israel and are publicly crucifying its political enemies. This is the same administration that ordered that the jihadist attack on Fort Hood be labeled as “workplace violence” and after promising to get the victims all the help they would need, has an administration that is quite publicly denying those victims and injured heroes such as Kimberly Munley benefits and aid. This is the same President and his administration that have been caught in lie after lie after lie in their cover up of the four Americans murdered in Benghazi. President Obama still refuses to let Congress have any access to the survivors of the attack. 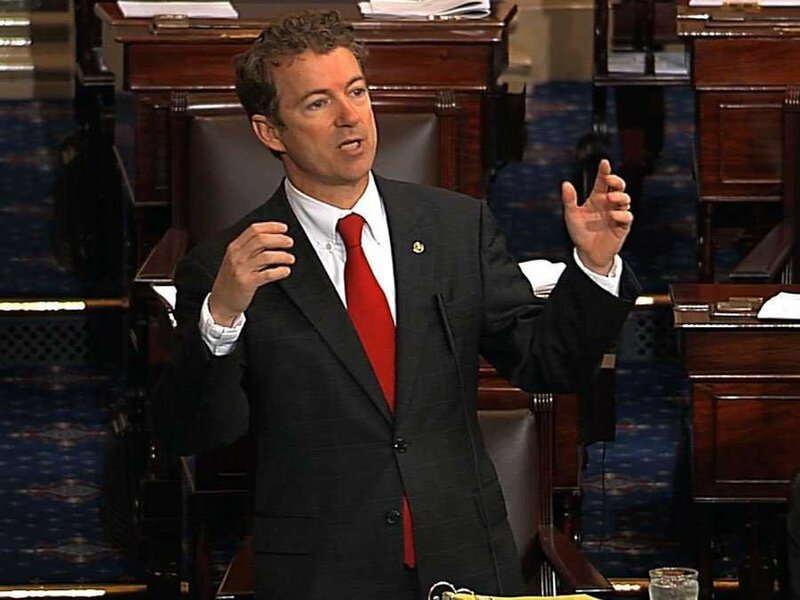 While Rand Paul was having his epic filibuster on the Senate floor with the help of Republican Sens. Mike Lee (Ut. ), John Barrasso (Wyo. ), Mitch McConnell (Ky.), Saxby Chambliss (Ga.), John Cornyn (Tex. ), Jerry Moran (Kan.), John Thune (S.D. ), Pat Toomey (Pa.) and Ron Johnson (Wis.). Sens.Ted Cruz (Tex. ), Jeff Flake (R-Ariz.) and Tim Scott (S.C.) made their first speaking appearances on the Senate floor. Sen. Angus King (I-Maine) and Sen. Ron Wyden (D-Ore.) also voiced their support. Senator Mark Kirk, made his first appearance on the Senate floor after having a stroke, he did not speak but he brought Rand Paul an apple and a thermos full of of tea (the same refreshment that Jimmy Stewart used in his famous film about a Senate filibuster). From the House Reps. Thomas Massie (Ky.) Justin Amash (Mich.), Ron DeSantis (Fla.), Doug LaMalfa (Calif.), Garland “Andy” Barr (Ky.), Trey Radel (Fla.), Michael Burgess (Tex. ), Jim Bridenstine (Okla.), Raul R. Labrador (Idaho), Keith Rothfus (Pa.), Paul Gosar (Ariz.), Steve Daines (Mont. ), Bill Huizenga (Mich.), Richard Hudson (N.C.) and David Schweikert (Ariz.) all came over to the Senate floor to show their support. While Senator Rand Paul was engaging in his epic filibuster to fight for your rights under the Constitution, John McCain was having dinner with President Obama. The problem is not that Rand Paul, Ted Cruz, Marco Rubio, and Justin Amash are “wacko birds”, the problem is that John McCain doesn’t get Barack Obama. This entry was posted in Civility, Cruz, Editorial, History, Jihad, Libya, Lies, Nikki Haley, Rand, Treason and tagged libya, mexican drug cartels, middle-east, politics. Bookmark the permalink.